CicLAvia announced some changes to the eastern end of the April 21 “CicLAvia to the Sea.” Originally, the route was going to start near City Hall, cut through the Downtown, head south on Figueroa until it hit Venice. Then it was a straight shot to the ocean. The new route will still run down Spring Main Street to 7th Street in the Downtown. However, now it will go west on 7th all the way until MacArthur Park at Alvarado Street. From there it will cut south until it hits Venice Boulevard. Then it’s a straight shot to the ocean. 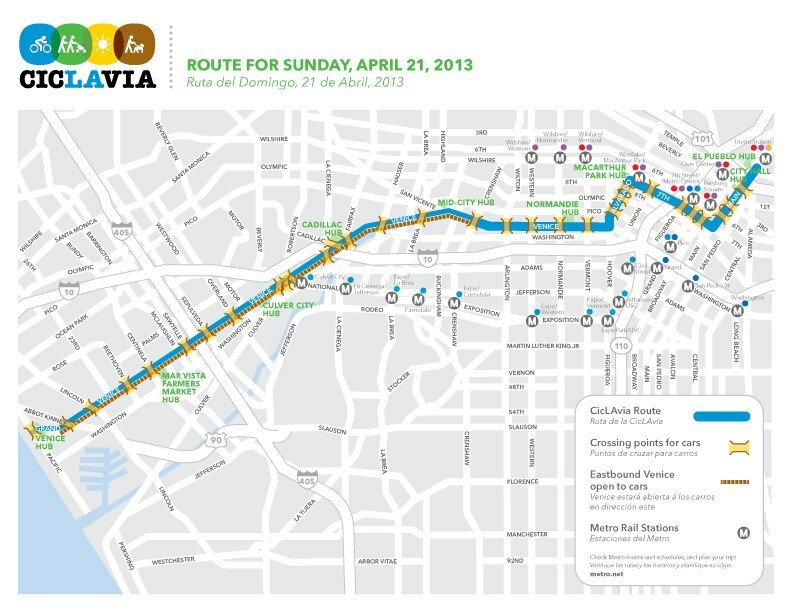 CicLAvia will run from 10 am to 3 pm on Sunday, April 21. All are welcome to take part in “L.A.’s biggest block party.” Bicycles are optional. don’t you mean run down main to 7th? that’s what the map says. Is it Spring or Main? When I first saw the route map for this year’s CicLAvia, I was worried it wouldn’t go down Spring. This event has been a boost to both my quality of life and my property value. I’m hoping it’ll go down Spring and not Main. CicLAvia will be on Main Street on April 21 and on Spring Street on October, 6, 2013. CicLAvia Announces 2014 Schedule: Wilshire Blvd., Heart of L.A. and New Route in South L.A.